2017 Leaf Metal Sports Heroes is an autograph-only set that features a diverse lineup from nearly every major sport. Each box includes five signed cards. 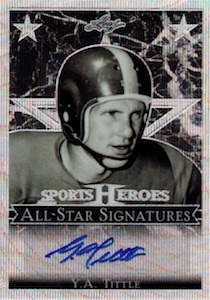 Like the previous non-Metal edition, the 2017 Leaf Metal Sports Heroes checklist covers legends across many athletic pursuits. However, it is officially a debut release for Leaf thanks to the chromium aspect. 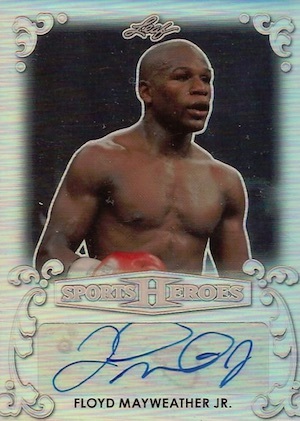 Up first, the Base Autograph set offers single-player signatures from names like Conor McGregor, Floyd Mayweather Jr., Ken Griffey Jr. and Lionel Messi. 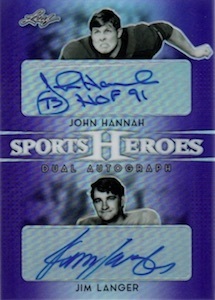 Increasing the signers, the Dual Autograph line features two subjects from the same sport, such as wrestlers Jimmy Hart and Ric Flair, while the Triple Autograph cards provide three legends in one. Award Winners is reserved for those who either won a statistical title, league championship or MVP honors. 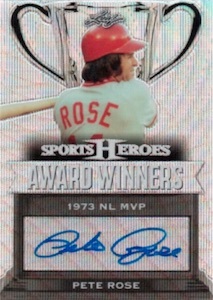 All-Star Signatures documents those that earned the annual honor from their respective league multiple times. 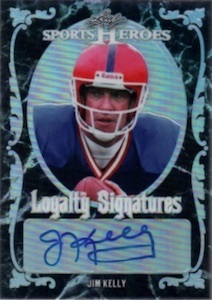 Superstars who dedicated their entire careers to one franchise receive a spot in the Loyalty Signatures insert. 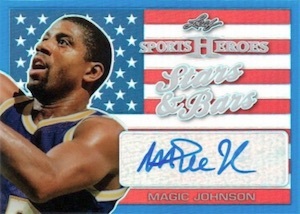 Featuring athletes donning the red, white and blue during international competition, Stars and Bars autographs are a patriotic affair. Looking ahead, rather than back, are Future Heroes autographs for the next group of star players. Adding to the excitement, collectors can also find a 2017 Leaf Q Preview card signed by Jack Eichel. Furthermore, 2015-16 Jack Eichel Rookie Tribute Metal features on-card signatures of the hockey star that are exclusive to the product. 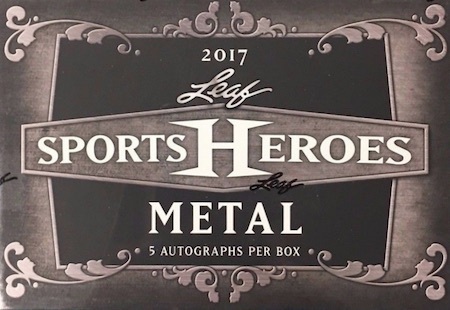 2017 Leaf Metal Sports Heroes is limited to 160 cases, or 1,920 boxes in total. 2017 LEAF METAL SPORTS HEROES EMMITT SMITH EARL CAMPBELL 1 1 BGS 10 10 AUTO !! Shop for 2017 Leaf Metal Sports Heroes autographs on eBay. PARALLEL CARDS: Wave #/25 or less, Blue #/10 or less, Purple #/5 or less, Pink #/4 or less, Black #/3 or less, Green #/2 or 1/1*, Red 1/1, Gold 1/1, Super 1/1, Printing Plates 1/1. PARALLEL CARDS: Wave #/25 or less, Blue #/10 or less, Purple #/5 or less, Pink #/4 or less, Black #/3 or less, Green #/2 or 1/1, Red 1/1, Gold 1/1, Super 1/1, Printing Plates 1/1. DA-01 Alex Rodriguez / Cal Ripken Jr. PARALLEL CARDS: Wave #/15, Blue #/7, Purple #/5, Pink #/4, Black #/3, Green #/2, Red 1/1, Gold 1/1, Super 1/1, Printing Plates 1/1. PARALLEL CARDS: Wave #/25 or #/10, Blue #/7 (Ripken Jr, Rose - #/10*), Purple #/5, Pink #/4 (Maddux - #/3*), Black #/3 (Maddux - #/2*), Green #/2, Red 1/1, Gold 1/1, Super 1/1, Printing Plates 1/1. PARALLEL CARDS: Wave #/25 or less, Blue #/10 or #/7, Purple #/5, Pink #/4, Black #/3, Green #/2, Red 1/1, Gold 1/1, Super 1/1, Printing Plates 1/1. PARALLEL CARDS: Wave #/25 (Patrick - #/10*), Blue #/10 (Patrick - #/7*), Purple #/5, Pink #/4, Black #/3, Green #/2, Red 1/1, Gold 1/1, Super 1/1, Printing Plates 1/1. PARALLEL CARDS: Wave #/25 or less, Blue #/7 (Cal Ripken Jr - #/10; Bo Jackson - #/3*), Purple #/5 (Jackson - #/3*), Pink #/4 (Jackson - #/3*), Black #/3, Green #/2, Red 1/1, Gold 1/1, Super 1/1, Printing Plates 1/1. PARALLEL CARDS: Wave #/25 or less, Blue #/10 (Lloyd, Retton - #/7*), Purple #/5, Pink #/4, Black #/3, Green #/2, Red 1/1, Gold 1/1, Super 1/1, Printing Plates 1/1. PARALLEL CARDS: Pink #/7, Black #/5, Green #/3, Red #/2, Gold 1/1, Super 1/1. PARALLEL CARDS: Green #/15, Gold 1/1. PARALLEL CARDS: Silver #/25, Gold #/10, Red #/5, Purple 1/1. PARALLEL CARDS: Blue #/15, Red #/10, Silver #/5, Gold 1/1. PARALLEL CARDS: Blue #/5, Red #/3, Silver #/2, Gold 1/1.